Bruins: Who Could Be This Year's Surprising Playoff Performers? Bruins: Who Could Be This Year’s Surprising Playoff Performers? Every year there seem to be a few surprise players who really turn it on come playoff time. For the Bruins, last season’s playoff run was no different. Michael Ryder and Chris Kelly were huge in the Montreal series. For much of the Spring, Dennis Seidenberg would have been the best defenseman on the ice if not for being paired with the man who stands ahead of him on that list, Zdeno Chara. When Boston picked up Pouliot on the first day of free agency, it left a lot of people scratching their heads. Pouliot has surpassed all expectations this season, as the low-risk/high-reward signing seems to have worked out for Boston. Capable of taking control of a game (a rare occurrence, but a possibility nonetheless), Pouliot has already tied his career high in points (30) this season. He’s playing for a contract, and he’s playing for a Stanley Cup contender. Pouliot should enter the post-season with a ton of motivation. Alongside Chris Kelly and Brian Rolston, the Bruins third line has been red-hot as of late, and they’ll look to carry that momentum into the playoffs. Much like the ever-inconsistent Michael Ryder (pre-Dallas days), Pouliot could fly under the radar and come up huge with a timely goal. Or a glove save, whichever he prefers. Before being sidelined for 19 games by a knee-to-knee hit in Montreal on February 15, Rich Peverley was one of Boston’s most consistent performers. His 39 points in 51 games don’t tell the whole story when it comes to this versatile winger. 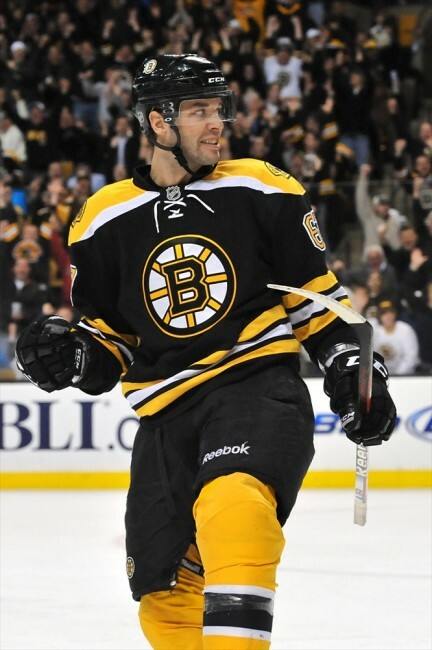 Peverley has the ability to fill any role the Bruins need him to. Last year, after Nathan Horton was knocked out of the Stanley Cup Finals in Game 3, Peverley took his place on the depth chart, and the Bruins top-line didn’t miss a beat. With Horton most likely sidelined for the playoffs, Peverley will have a chance to shine once again. It’s that type of adaptability that makes Peverley a very dangerous, yet underrated player. Bruins general manager Peter Chiarelli rewarded Peverley with a three-year deal earlier in the season, and so far Peverley has proven this was a solid investment. Look for that trend to continue in the playoffs. A sophomore slump wasn’t really possible for Tyler Seguin, who had just 22 points in 74 games his rookie year. Of course, he had a storybook introduction to the playoffs with a magnificent performance against the Tampa Bay Lightning in the Eastern Conference Finals. His play soon subsided, and he was more-or-less a non-factor in the Finals. This season, Seguin has started to become the player Boston believed they were drafting in 2010. Leading the team with 61 points, and on pace for a 30-goal season, Seguin will look to continue his career’s progression with a strong post-season. Much of Seguin’s success can be attributed to his linemates Patrice Bergeron (58 pts) and Brad Marchand (50 pts). Coach Claude Julien isn’t likely to break up the trio this Spring, and if the Bruins are going to make a run, this line will be instrumental. Chris Kelly has been described as the poor-man’s Patrice Bergeron. And while the title may seem a bit belittling, it’s not untrue. Kelly is one point away from a career high (38), and is one of Julien’s most trusted performers. When your third-line center can be a shut down two-way forward, and be in your team’s top 10 point producers, it’s a pretty good sign in terms of depth. Last year Kelly donned a full cage after breaking his face (scientific explanation) early in the Montreal series. He then went no to play a huge role in Boston’s comeback series victory. While he may not be considering taking the cage out of retirement, he can remain hopeful that his post-season luck will continue. Okay, let’s face it. Despite a very solid performance in 2011-2012, it just doesn’t feel as magical as the 2010-2011 season did for Tim Thomas. And how could anyone expect it to? With a 2.44 GAA (his NHL career third best), Thomas has been forced to shoulder the load down the stretch with Tuukka Rask sidelined. Thomas is obviously still one of the top goaltenders in the world, but you know it kills him to take the inevitable step back from last year’s record setting campaign. Obviously Tim Thomas has a history of proving people wrong, and there aren’t too many people who believe that Thomas can lead the Bruins to a second consecutive Stanley Cup.